A ligament is a band of tissue that connects a bone to another bone. The collateral ligaments of the knee are located on the outside of your knee joint. They help connect the bones of your upper and lower leg, inside your knee joint. The lateral collateral ligament (LCL) runs on the outer side of your knee. The medial collateral ligament (MCL) runs along the inside of your knee. A collateral ligament injury occurs when the ligaments are stretched or torn. A partial tear occurs when only part of the ligament is torn. A complete tear occurs when the entire ligament is torn into two pieces. The collateral ligaments help keep your knee stable. They help keep your leg bones in place and keep your knee from moving too far sideways. A collateral ligament injury can occur if you get hit very hard on the inside or outside of your knee, or when you have a twisting injury. Skiers and people who play basketball, football, or soccer are more likely to have this type of injury. Your knee is unstable and can shift side to side as if it "gives way"
Most people do not need surgery for an MCL injury. However, you may need surgery if your LCL is injured or if your injuries are severe and involve other ligaments in your knee. Ice your knee for 20 minutes at a time, 3 to 4 times a day. You can use ibuprofen (Advil, Motrin), or naproxen (Aleve, Naprosyn) to reduce pain and swelling. Acetaminophen (Tylenol) helps with pain, but not swelling. You can buy these pain medicines at the store. Talk with your doctor before using these medicines if you have heart disease, high blood pressure, kidney disease, or have had stomach ulcers or internal bleeding in the past. You should not put all of your weight on your leg if it hurts, or if your doctor tells you not to. Rest and self-care may be enough to allow the tear to heal. You should use crutches to protect the injured ligament. You may need to work with a physical therapist (PT) to regain knee and leg strength. The PT will teach you exercises to strengthen the muscles, ligaments, and tendons around your knee. As your knee heals, you can return to normal activities and maybe play sports again. Lento P, Akuthota V. Collateral ligament sprain. In: Frontera WR, Silver JK, Rizzo TD Jr, eds. Essentials of Physical Medicine and Rehabilitation: Musculoskeletal Disorders, Pain, and Rehabilitation. 3rd ed. Philadelphia, PA: Elsevier Saunders; 2015:chap 66. Miller RH, Azar FM. Knee injuries. In: Azar FM, Beaty JH, Canale ST, eds. Campbell's Operative Orthopaedics. 13th ed. Philadelphia, PA: Elsevier; 2017:chap 45. Wilson BF, Johnson DL. Medial collateral ligament and posterior medial corner injuries. In: Miller MD, Thompson SR, eds. DeLee and Drez's Orthopaedic Sports Medicine: Principles and Practice. 4th ed. Philadelphia, PA: Elsevier Saunders; 2015:chap 100. The medial collateral ligament connects the end of the femur (thigh) to the top of the tibia (shin bone). The medial collateral ligament provides stability against valgus stress. A valgus stress is described as a pressure applied to the leg that tries to bend the lower leg sideways at the knee, away from the other leg. Tackling in football or soccer are two common causes of this injury. 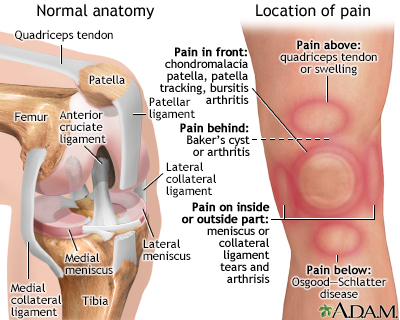 The location of knee pain can help identify the problem. Pain on the front of the knee can be due to bursitis, arthritis, or softening of the patella cartilage as in chrondromalacia patella. Pain on the sides of the knee is commonly related to injuries to the collateral ligaments, arthritis, or tears to the meniscuses. Pain in the back of the knee can be caused by arthritis or cysts, known as Baker&#8217;s cysts. Baker&#8217;s cysts are an accumulation of joint fluid (synovial fluid) that forms behind the knee. Overall knee pain can be due to bursitis, arthritis, tears in the ligaments, osteoarthritis of the joint, or infection. Instability, or giving way, is also another common knee problem. Instability is usually associated with damage or problems with the meniscuses, collateral ligaments, or patella tracking. Initial treatment of an MCL injury includes ice to the area, elevation of the joint above the level of the heart, non-steroidal anti-inflammatory drugs (NSAIDs), and limited physical activity until the pain and swelling subside. A hinged knee immobilizer should be used to protect the ligament as it heals. The extent of this type of injury is usually excessive stretching of the ligament causing the pain and tenderness. A torn (MCL), is an injury to the medial collateral ligament. This ligament extends from the upper-inside surface of the tibia to the bottom-inside surface of the femur. The ligament prevents the knee joint from medial instability, that is, instability in the inside of the joint.